FAQ: "How much face paint do I need?" One of my most frequently asked questions that I get from my customers is, "how many faces can I paint with this set?" or, "I'm painting [x number of] kids; how much paint do I need?" Range of colors in your designs. Are you displaying a board of designs that use all colors of the rainbow? Or are you doing a Christmas event where you'll be using a lot more green and red than other colors? If you're using all colors relatively evenly, a rainbow palette should work great as a starting point for many events. If you're planning to use a lot more of certain colors, the 2.5 ounce cakes will ensure you don't run out, or a few extra palette refills of the colors you're using most. And keep in mind, even if your design menu reflects a wide range of colors, you still can't guarantee you'll use them evenly. I can't tell you how many times I do one unicorn, and then every girl after that wants the same thing, making me use a lot more white than other colors. How much water you use. Being that the paints are water based, you'll be using water on your brushes and sponges to apply it. 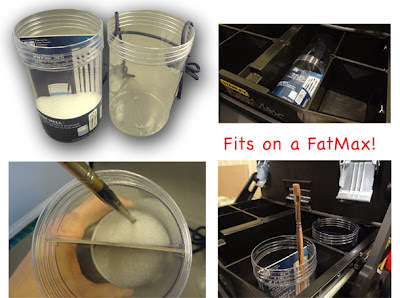 The amount of water you use when you paint, coupled with the above factors, can mean the difference of your paints lasting through one gig or through a year's worth of gigs. More water will stretch your paints farther, but give you less vivid colors. Less water can make your paints bright and bold, but not last as long. Every artist will have their own unique ratio that they like to work with. What type of paint you use. 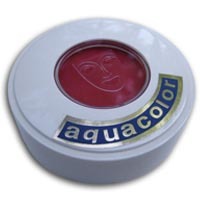 For example, referencing the Kryolan paints that I sell, the metallic, interferenz, and UV-Dayglow paints require more water and more paint to get them to a good covering consistency than the regular Aquacolor bright color palettes, because they are made up of different ingredients. If you use these more sparingly as accents like I do, they will last you years. But if you are trying to paint a tin man and make his entire face look like silver, you could easily use up most of a 2.5 oz cake....whereas a 2.5 oz cake of Aquacolor blue (maybe you're dressing up as Blue Man Group for Halloween? ), could cover several people's faces, arms and hands. How many artists are painting. It would logistically be very hard for more than two artists to share a palette. You could theoretically have one artist on either side of a table with one palette, and then you'll have your "subject" in front of each artist. 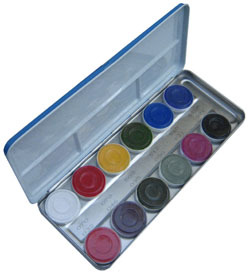 Having had to share paints in the past myself before, I'd prefer to have my own palette to work from. But, at the bare minimum, I'd suggest 1 palette per 2 artists, if you can afford it. Some artists may use more paint than others as well due to the other factors I mentioned, so increasing the amount of paint you have on hand will help ensure you have enough. Every artist needs their own set of brushes as well...you do not want one artist sitting there painting nobody because he or she is waiting for the outline brush from another artist...otherwise there is no point in having more than one painter. "So how do I estimate then?!" So, you may be saying, now what? How am I supposed to estimate what I need?! Many other face paint supply websites will claim some number of faces you can paint with their sets, but the reality is obvious, that it really depends on too many things to give an accurate number. Just know that these numbers are only estimates, based on one person who is making an assumption about how and what you will be painting. • You already have a full professional kit but would like to play around with a bunch of new colors and affects before investing in the larger cakes. • You just want to have a set of quality paints around to do your kids' faces every year for Halloween or for their birthdays? Any of the palettes are a great option for you. I'd recommend starting with a set of the bright Aquacolor basic colors to start, the 12 or 6 color palettes depending on the colors you want. If you want to add more excitement to your selection, you can always try out the interferenz paints, metallics, or fluorescent UV-Dayglow paints. Or, you can even build your own set and mix and match on my site. You can always purchase more refill cakes to replace any that run out down the road! • Brushes: I'd recommend a set for each artist at minimum: a #5 and #2 round to cover both larger areas and outlining. • Sponges: If you plan to do full-face designs or do quick rainbows with a rainbow palette, a sponge will cover very large areas very quickly. • Glitter: If you want to add some sparkle, the "multi" and "blue violet" work great on every color of paint, but there are many colors if you want to have a lot of fun with it! • Practice Head: A practice head is great for practice, whether you're just starting out or are a professional looking to perfect your designs on your own schedule without relying on a willing "subject!" If you're still left wondering after reading this post, feel free to comment here with your questions or shoot me an email...I love to help! Now Shipping: New Products from Loew-Cornell! We're not carrying more fun products from Loew-Cornell in the Paintertainment online shop! You can now find these "Spongit 3-packs" for just $4.59! Each wood handled Spongit comes with two different diameter ends, ranging from 1/2" to 1-1/4" in diameter. We also have some more great items to help you extend the lives of your brushes! Do you use a Stanley FatMax toolbox for your kit? If you do, you'll love how these next three products fit perfectly into your kit! This Brush Well is just $5.49 and does double duty as a brush holder/protector for up to 20 brushes, and a rinse water container. The round Brush Tub ($7.99) is a great little rinse tub, complete with a ribbed bottom to aid in cleaning, and built in brush holders to protect your bristles. Each one has 21 holes to display and organize your brushes while you paint.